The famed recording returns in a premier vinyl reissue from Analogue Productions! Plated and pressed at Quality Record Pressings on 200-gram vinyl! Deluxe old-style tip-on gatefold jacket with additional photos from the Sony Music Archives! Bruno Walter helped shape the very essence of interpretive style among conductors. Walter's rendition of Beethoven's sixth symphony is perhaps the greatest ever recorded — his reading of the score comes off sounding like a piece of literature or poetry, but that is a great thing and perfectly blends with the music to create a benchmark recording. And here, once again, Analogue Productions has taken a classic and shaped it to make the premier reissue of this famed LP. Ryan Smith at Sterling Sound mastered this album from the original analog tapes. The cut lacquers were plated and pressed to 200-gram vinyl by our own Quality Record Pressings. The Stoughton Printing old-style tip-on gatefold jacket has been upgraded handsomely by a series of rarely-seen photos of Walter from the Sony Music Archives. Everything about this reissue radiates quality. Written in 1808, Beethoven's Symphony No. 6 in F Major ("Pastoral"), Op. 68, is deemed one of the most influential by the famed composer. 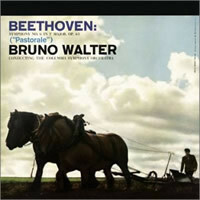 Unlike the vast majority of assumed names by which his works have become known, Beethoven directed from the very outset that his sixth symphony be titled "Pastoral Symphony," or a recollection of country life. It was a musical approach to the forces of nature that inspired Beethoven. Walter's late life was marked by stereo recordings with the Columbia Symphony Orchestra, an ensemble of professional musicians assembled by Columbia Records for recordings. Originally released in 1958, this recording still sounds fresh, with a broad soundstage, persuasive depth, and a remarkable sense of "air" and presence. Simply because of Walter's vibrant, fluid interpretation, taking into account both variable tempi and heightened accents, the result is one of the most passionate, awe-inspiring recorded versions of this symphony that's ever been recorded.